A secretive directive from the Chinese Communist Party warning party members of the dangers of a free press, democracy, and other Western notions was leaked to the anxiety of Web users who feared the government's grip on power. Document No. 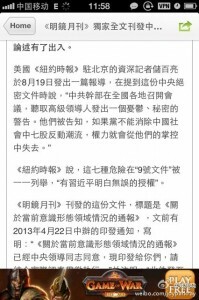 9, as it is referred to, was issued  in April 2013, but was not openly published, and any curious discussion about it was soon censored on Chinese social media. In August 2013, however, the document was leaked, and the whole piece was published by Hong Kong-based Minjing news  [zh] on Aug 19, 2013. The document titled “Concerning the Situation in the Ideological Sphere” referred to as Document No. 9 warns party members that they face losing power if they fail to address subversive elements in Chinese society . The document reveals President Xi Jinping's conservative political stance since his rise to power despite economic reform and a crackdown on corruption. Netizens shared the full version of Document No. 9 on Sina Weibo . 1. Promoting Western constitutional democracy. Attempting to negate current leadership and deny the socialist political system with Chinese characteristics. 2. Promoting the universal value of human rights. Attempting to shake the party's ideological and theoretical foundation. 3. Promoting civic participation. Attempting to disintegrate the social basis of the ruling party. 4. Promoting neo-liberalism. Attempting to change China’s basic economic system. 5. Promoting Western-inspired notions of media independence. Challenging the principle of party-controlled media and the press and publication management system. 6. Promoting historical nihilism. Attempting to negate the history of Chinese Communist Party and the history of the New China. 7. Questioning the Reform and Opening up , questioning socialist nature of socialism with Chinese Characteristics. The document also involves the “seven speak-not ” subjects, a policy for university professors instructing them not to teach seven subjects, including freedom of the press, past mistakes of the communist party, and citizen rights. After the Document No. 9 was shared on China’s most popular microblogging Sina Weibo, many worried about the government's seemingly increasingly powerful hold. Earlier this month, Beijing authorities set up a site  [zh] where users can be alerted of online rumors. This week, Chinese police have detained  two Internet users for allegedly starting online rumors that tried to defame government groups and a cultural icon. Another Cultural Revolution , and the 50 Cent Party [editor's note: Internet commenters paid by the Communist Party of China to write favorably about the party] is alive again. The content of Document No. 9 is disappointing. If the top level is so determined, and considers necessary reform as subversion, then my passion for a better China is worth rethinking. Document No. 9 will become the starting point of a great debate on the ideological revolution, and it is by no means the end. Constant bursts of absurdity detailing the background information of officials will help people understand the truth and choose the right path. Anti-constitutionalism is for the sake of maintaining and consolidating authoritarian rule. The rising wave of anti-constitutionalism in 2013 has special significance. It serves as a starting point of a conversation about freedom and democracy. As expected, despite the lecturing of Document No. 9, not many have showed enthusiasm. What magic does the cultural autocracy still have?